Five people were injured in a truck accident involving three other passenger cars on Interstate 5 near Holgate Monday night. 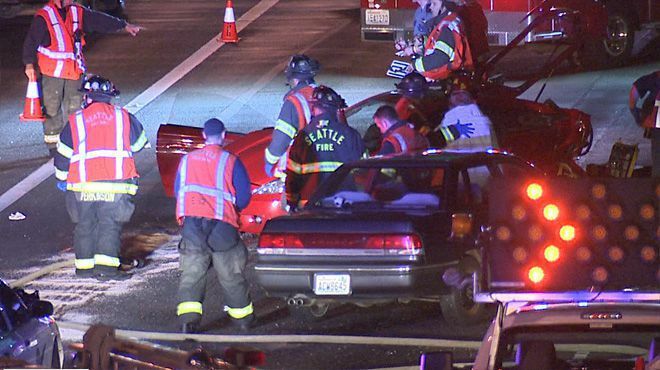 Police say that all of the cars involved in the incident were heading northbound on I-5 when a 31-year-old man from Tukwila driving a Mitsubishi Eclipse hit another vehicle. The collision caused the man’s Eclipse to slide underneath the semi-truck, resulting in the collision of the other two vehicles. The man was trapped inside of the Eclipse and firefighters spent hours working to free the man from the vehicle, and the interstate was shut down for several hours. Reports indicate that the man was taken to Harborview Medical Center with critical injuries. Police said that three other people involved in the crash were also taken to Harborview. According to the Washington State Patrol, one of the drivers was arrested for investigation of DUI. Although she may have been under the influence of drugs or alcohol, police said it was unclear if she had anything to do with the cause of the accident. The award-winning attorneys at Davis Law Group help victims of car accidents in Seattle get financial compensation for their injuries and lost wages. We work closely with the criminal prosecutor to make sure that all avenues, both criminal and civil, are being pursued. If you have been the victim of a vehicle accident, contact Davis Law Group at 206-727-4000.